Pundits (unlike myself) are often criticized for giving their opinions according to the result, and not according to what they think the game offers at that particular moment in time. The match that pit Juventus against Udinese was supposed to present two title contenders - but unfortunately only one of them showed up (for most of time, that is). In fact, the match seemed to go against what would be expected by most - myself included. These two teams had met a little over a month ago, but this time Juve were without Pepe and Marchisio (replaced with Giaccherini and Quagliarella) and Udinese weren't able to call upon Asamoah and Pizni). 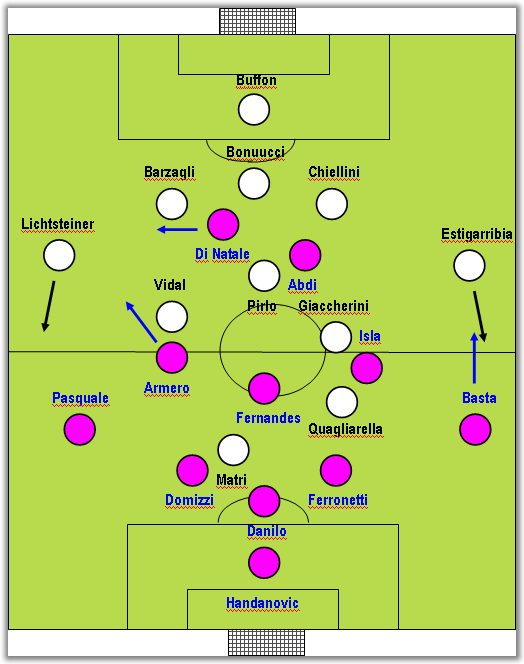 Just like the match in December, Antonio Conte chose to mirror the system of Udinese, going with what can broadly be described as a 3x5x2, where as Francesco Guidolin had to reshuffle all of his midfield, which would prove decisive for the final outcome. In the second minute, the bianconeri were already performing one of their trademark moves. If we compare the first clip with the first goal against Roma (second clip), we will be able to see several similarities. Even though the players finishing the moves are not starting out from the same position on the field, the principle is the same: a quick run on the weak side of the ball in order to take advantage of numerical inferiority or equality. Udinese started out by assuming a clearly counter-attacking stance, keeping a low defensive line and choosing to be up in numbers. Pasquale's fielding on the left wing was surely intentional, since Guidolin will have wanted someone to mark Lichsteiner a bit closer. With Asamoah and Pinzi absent, Udinese found themselves with no out-ball and no one to act as a pivot, a role that Pinzi plays so well. This meant that, unlike the match in December, there was hardly anyone to take the ball up to Di Natale or Abdi, which in turn meant that Juve just kept on piling up the pressure. Armero, playing out of his natural position, tried to deputise as the exit man, but often seemed to forget that his job wasn't just motoring up the field. 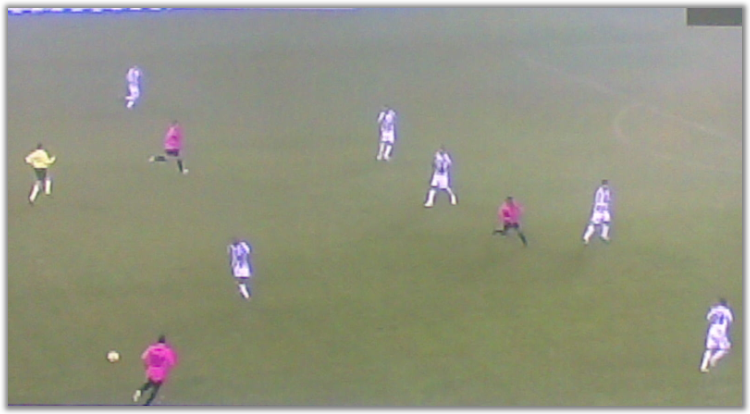 As seen here, Udinese's midfield was constantly left exposed due to Armero's venturing forward. It is still strange to notice, particularly in a league as tactically aware as the Italian, how much time Andrea Pirlo is allowed on the ball. He was able to dictate the tempo and re-start the moves after Udinese throwing the ball forward, in a desperate attempt to relieve the pressure. Actually, Abdi did not exert any sort of pressure upon Pirlo (even though he seemed to have tried at first), and he even started going backwards, possibly trying to help his porous midfield. Therefore, it was no surprise that he didn't make it back on the second half - his replacement, Floro Flores, was a bit more incisive. When Juventus scored towards the end of the first half, there was some curiosity as to what their plan B would be, given that they had been so hesitant. Oddly enough, just when everyone Juve had the game in the bag (and so it seemed to yours truly), they suddenly dozed off and let Udinese back in the game with wayward passes that mostly Isla intercepted, using those interceptions to counter-attack. Di Natale shot for the first time on 52 minutes and, only two minutes later, Floro Flores scored. Even though the goal came apparently out of Juve's own mistakes, Udinese seemed to be right where they wanted. Feeling the game was getting out of hand, Conte replaced Quagliarella (such an improvement on that particular position, when compared to the out-of-place Pepe). Once again, Udinese's goal meant nothing and they ended up conceding precisely when it seemed that Juventus would play into their hands. 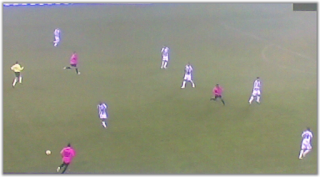 After that, it was one-way traffic and the team from Udine showed that they never wanted anything more than a draw. I would just like to point out two issues. The first one has to do with Matri. Almost unnoticeably, he managed to have 50 touches (Di Natale had 27, as a reference), from which he mustered 3 key passes, 5 shots (3 of which on target) and 2 goals. It doesn't get much better than that for a forward. The second issue relates to Giaccherini. Not only is he an avid scorer (he scores 1 goal every 5 games, on average), but he also has a tendency to find spaces to run into, opening spaces for himself and others to score. Definitely a player on the rise.